Information on treating precancerous lesions in Mountain View arriving soon! Call our office to learn more about treatment for your precancerous lesions. 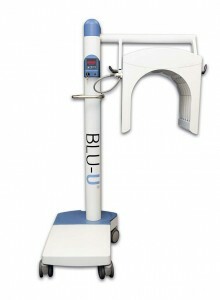 The BLU-U® Blue Light Photodynamic Therapy Illuminator system by DUSA Pharmaceuticals, Inc. gained FDA approval in 2003 for the treatment of mild to moderate acne. It is a compact light source with u-shaped fluorescent tubes designed to uniformly distribute blue light onto the treatment area. BLU-U® blue light system can be used alone as an acne treatment, or with Levulan® solution as part of blue light photodynamic acne therapy. What is Blue Light Acne Therapy? What Is the Blue Light Procedure Like? Blue light therapy treatments are relatively quick and easy. Patients either sit or lie down during treatment, and a light source is placed close to their face for about 20 to 30 minutes. * Most patients do not experience pain or discomfort during exposure to the light, and they can get back to their normal routine immediately following a blue light acne therapy session. * Treatments are typically repeated once or twice weekly for several weeks until optimal results are achieved. * Some patients experience an improvement of their acne for several months. * However, maintenance treatments are often recommended to sustain results. The number of treatments needed to reach optimal results may vary depending on the severity of your acne.